We found a Fisher-Price Toy Deal on Amazon for you! Stacking toys are great fun for babies and toddlers and improve their fine motor skills. Hurry and get the Fisher-Price Stack & Slide Magic Mountain today for $14.99 only $6.93 from Amazon! Save 54%. Limit 3. Check out all of the recent Amazon deals here! 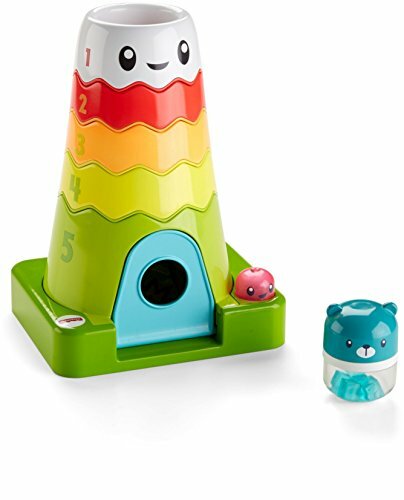 “Peak” your baby’s interest with this magical mountain, which features colorful rings for stacking and building fun, a light-up purple pal, and a little rattle bear to send sliding down the mountain! Rewarding sounds, phrases, and music introduce your little mountaineer to counting and colors and keep the fun climbing! Where development comes into play Fine Motor: As your baby grasps and stacks the rings and drops the rattle bear through the mountain, they’re developing hand-eye coordination and dexterity. Problem Solving: As little ones work to figure out how to stack the rings to create the mountain, they’re developing important problem solving skills Curiosity & Wonder: Your baby is introduced to cause and effect as they discover how to activate the lights and sounds by pressing the light-up purple pal or dropping the rattle through the mountain. Buy the Fisher-Price Stack & Slide Magic Mountain from Amazon.